Here’s an incredible story about an unsung hero that, by simply going about its normal existence, is making the world a better place: This dog named Pilot has no idea it is single-handedly supporting nearly every conversation at this party. Absolutely beautiful. 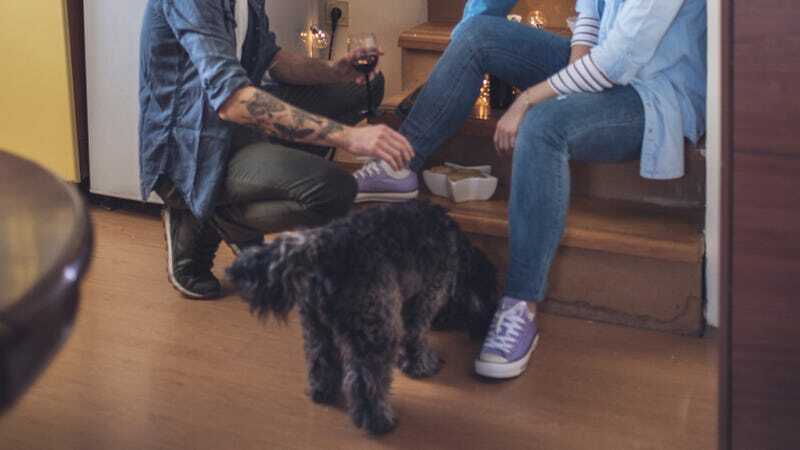 This dog may not know it, but it is actively making this awkward party bearable in a major way. Before the party even started, Pilot’s quiet heroism was already at work. A friend of the host’s friend had arrived 20 minutes before anyone else, all but guaranteeing a long, forced conversation that neither participants wanted to take part in. But luckily, Pilot didn’t hesitate to jump up on the early guest immediately, giving the host an easy segue into a reasonably natural talk about the dog’s name, age, and breed just as the panic of an incoming stilted dialogue was setting in. As the rest of the party guests arrive, this dog continues to save the day over and over again simply by walking around and giving everyone at this unbelievably boring party something easy to talk about, like how well-behaved he is or his cute attempts to sneak food off the snack table. Running out of things to say is not a possibility with Pilot present, and though he may not know it, literally every guest present is keeping him on their radar so they can point at him and say, “Oh my god, look what the dog’s doing now,” or “What a good boy,” when conversations start getting stale. In one particularly moving act of brave intrepidity, the dog started barking at nothing in particular, which immediately gave about eight half-hearted, dead-end conversations at this party a much-needed jolt of enthusiasm as their topics all turned back to him and how great dogs are. For every time someone walks away from a small circle of guests to go get another drink, leaving only two barely acquainted people standing next to each other, Pilot will selflessly eat half a cracker that someone dropped on the ground or offer his belly up to be scratched and petted, giving two awkward guests a chance to chuckle and then ask each other if they own a dog, or some other type of pet. If that’s not heroism, we don’t know what is. This dog will never receive any praise or recognition for the incredible godsend it’s been for everyone at this party, nor will it ever expect it, but it sure makes it easier to sleep at night knowing there are silent heroes like him there to bail people out of bad party conversations.